Talk about dedication to your craft. We car nuts still reminisce about our car-festooned childhoods. Some of us never outgrow it, thumbing through every car magazine and watching just about every car video out there (not us. *cough*). And then there are truly those who never outgrow it. 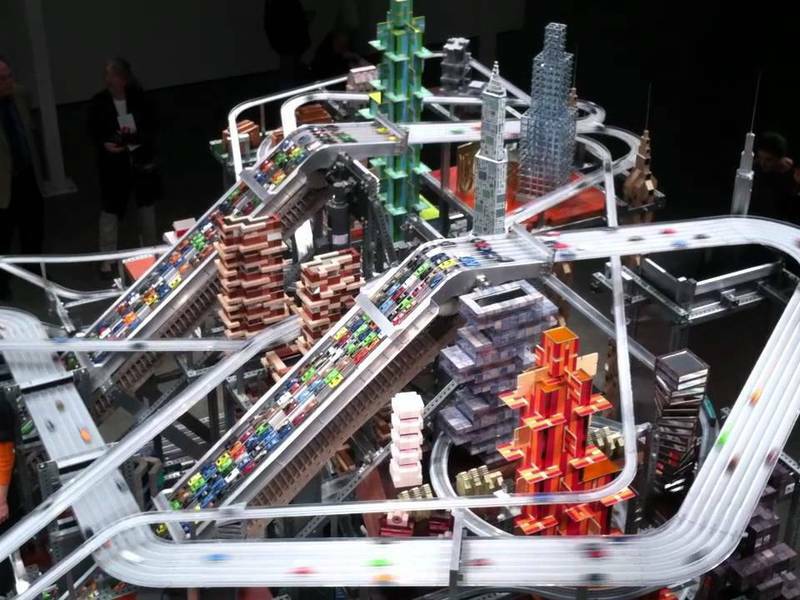 Case in point, late artist Chris Burden and his Metropolis II kinetic sculpture that's truly epic. Take a look at the video below. The huge installment is pretty much a small city. It's currently an installment at the Los Angeles County Museum of Art (LACMA), and the sheer scale is staggering. Burden and his chief engineer took four years to plan out Metropolis II, which is 20x30 feet. There are 25 buildings, 13 trains, and a ridiculous 1,100 cars running on 18 roadways that includes a six-lane road. It's hard to imagine the amount of planning and customization that went into it. The buildings use a crap ton of legos, as well. Whereas his previous installment, known as Metropolis I, used 80 cars that were conventional Hot Wheels cars, but for Metropolis II, he needed more. The cars in Metropolis II are traveling at a scaled speed of 230 mph, so there's a lot of wear, even though the piece isn't active 24/7. It runs 3 days a week for a few hours per day. Every hour, a volume of 100,000 cars runs through the system. The cars for Metropolis II are specially made in China for the artwork. Every car has been made tougher than normal Hot Wheels or Matchbox cars. Axles are reinforced, and bumpers are bigger than usual. The cars don't have brakes and have no power of their own, so braking is done by rising walls in the curves. There are two attendants who have to clear up jams if they happen since the only automation is the trains and the escalators that move the cars up the track. Sadly, Burden passed away in 2015, but his legacy lives on in his supremely complex kinetic sculpture. There really is nothing quite like it, and it makes a slot car race track look like baby's toy by comparison. The Metropolis II was purchased for a hefty sum amounting to millions, but the piece(s) are on loan to LACMA for 10 years. Check out another video below for more mesmerizing footage.